Solitude Lake Management completed a certified hydrographic survey and sediment survey as part of a dredging analysis report. This 29 acre lake, originally built in the early 1900’s has an average water depth of 2.6 feet. Through sediment sampling, the average soft sediment thickness is 2.1 feet. Over time the lake has lost almost half of its original capacity to sediment. The estimated sediment volume was calculated and shown on a map. This will allow engineers to create an efficient removal plan. Dredging contractors can bid with confidence on how much sediment is actually in the lake. 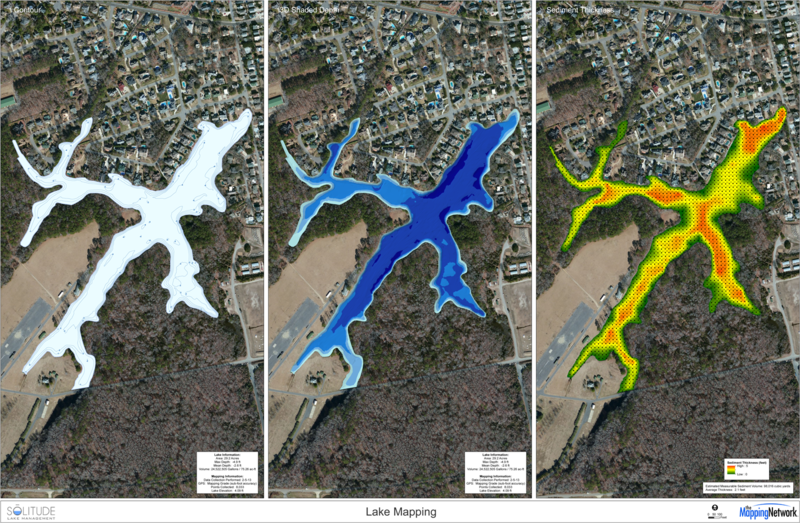 The homeowners will ultimately benefit most from having an initial hydrographic survey because they will be able to control the project from start to finish – taking out the guess work and making sure their lake is restored for the lowest cost possible. This entry was posted in Lake Map, Sediment and tagged Bathymetric Map, dredge bid, dredge costs, dredge pricing, Dredging, Engineer Bathymetry, Engineer Lake Map, Fishing, GIS, GPS, GPS Lake, GPS Map, Habitat, Hunting Land, Hunting Property, hydrographic survey, lake, lake dredge, Lake Management, Lake Map, Lake Mapping, Lake Survey, map, Sediment, Sedimentation, smith mountain lake, smith mountain lake bathymetry, smith mountain lake map, Survey, The Mapping Network, Virgina Lake Management, Washington Lake on September 10, 2013 by Moderator.